Today I will be talking about a writer of the caliber of Chinua Achebe and Ngugi wa Thiong’o, a writer often forgotten, a writer who fought with his writings for independence, a Cameroonian writer who wrote about Cameroon’s first freedom fighter Ruben Um Nyobé, and whose writings were banned… you have probably guessed it, I am talking about the great Mongo Beti. Mongo Beti was born Alexandre Biyidi Awala, on 30 June 1932 in Akométan, near Mbalmayo, south of Yaoundé, the capital of Cameroon. From a young age, Mongo Beti was already exposed to the currents of independence and freedom that were shaking Cameroon, and was exposed to Um Nyobé. He would eventually get expelled from the local missionary school at 14, for being outspoken. As he himself said “At the time, I was very shocked by the idea of confessing my sins to someone else.” He would eventually attend the Lycee Leclerc in Yaoundé, and then move to the Sorbonne in Paris, France, for further studies. Mongo Beti claimed that he entered writing through writing political tracts. 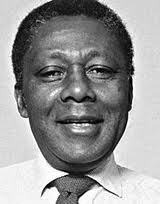 His first piece was a short story published by Alioune Diop in 1953 in Présence Africaine, “Sans haine et sans amour” (Without hatred or love). He first started writing under the pen name Eza Boto, by fear of retaliation from the French colonial regime. His first book “Ville Cruelle” or “Cruel City” published in 1954, was actually on the school program in all high schools of Cameroon for many years in the 80s to late 90s. His second novel “Le Pauvre Christ de Bomba” (“The Poor Christ of Bomba“) was published under the pseudonym Mongo Beti, to distance himself from his previous piece. The name Mongo Beti means in Ewondo, ‘Son of the Beti people’. This new novel created a scandal because of its satirical and biting description of the missionary and colonial world. Under pressure from the religious hierarchy, the colonial administrator in Cameroon banned the novel in the colony. This novel was followed by “Mission Terminée” in 1957 (winner of the Prix Sainte Beuve 1958), and Le Roi Miraculé, 1958. All three books were translated into English and many other languages, which gave Beti a lasting international reputation. During this time, he also worked for the review Preuves, for which he reported from Africa, as well as a substitute teacher at the lycée of Rambouillet. He later on taught at the Lycee Pierre Corneille of Rouen until his retirement in 1994. ‘Wanted’ in the colony because of his sharp writings, and his connections to the UPC of Ruben Um Nyobé, Mongo Beti stayed in France. Ruben Um Nyobe’s murder by the colonial administration in 1958, truly shook Beti to his core; he fell silent and did not publish any book for the following decade. In 1971, he finally wrote “Main Basse sur le Cameroun, autopsie d’une décolonisation” (Cruel hand on Cameroon, autopsy of a decolonization) which was censored upon its publication by the French Ministry of the Interior Raymond Marcellin on the request, brought forward by Jacques Foccart, of the Cameroon government, represented in Paris by the ambassador Ferdinand Oyono. This essay perhaps sprang from frustration and rage at the collapse of the UPC rebellion and the public execution of its last leader, Ernest Ouandié, in 1970. It was a devastating critique of the authoritarian regime of Cameroon, and asserted that Cameroon and other colonies remained under French control in all but name, and that the post-independence political elites had actively fostered this continued dependence. The 1970s also saw two of his most passionately political novels, “Remember Ruben“ and “Perpetue et l’Habitude du Malheur,” both published in 1974. In 1978 he and his wife, Odile Tobner, launched the bimonthly review Peuples Noirs. Peuples Africains (‘Black People. African People‘), which was published until 1991. This review chronicled and denounced tirelessly the evils brought to Africa by neo-colonial regimes. During this period were published the novels La Ruine presque Cocasse d’un Polichinelle (1979), Les deux mères de Guillaume-Ismael Dzewatama (1983), La revanche de Guillaume Ismaël Dzewatama (1984), also Lettre ouverte aux Camerounais ou la deuxième mort de Ruben Um Nyobé (1984) and Dictionnaire de la Negritude (1989, with Odile Tobner). Frustrated by what he saw as the failure of post-independence governments to bring genuine freedom to Africa, Beti adopted a more radical perspective in these works. 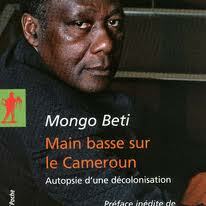 Mongo Beti returned to Cameroon in 1991 after 32 years of exile. 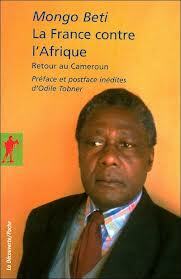 In 1993 he published La France contre l’Afrique, Retour au Cameroun, a book chronicling his visits to his homeland. After retiring from teaching in 1994, he returned to Cameroon permanently. He opened the Librairie des Peuples noirs (Bookstore of the Black Peoples) in Yaoundé and organized agricultural activities in his village of Akométam. However, his return did not leave the government silent: he was subjected to police aggression in January 1996 in the streets of Yaoundé, and was subsequently challenged at a demonstration in October 1997. In response he published several novels: L’histoire du fou in 1994 then the two initial volumes Trop de Soleil tue l’Amour (1999) et Branle-bas en noir et blanc (2000), of a trilogy which would remain unfinished. He was hospitalized in Yaoundé on October 1, 2001 for acute hepatic and kidney failure which remained untreated for lack of dialysis. Transported to the hospital in Douala on October 6, he died there on October 8, 2001. Some critics noted the similarity of his death to that of his heroine Perpetua, who also died while awaiting treatment in one of the country’s overburdened hospitals. As I write about him today, I feel very sad that we, in Cameroon, don’t honor our heroes. No one can even fathom the depth of Mongo Beti’s work. It is immense, and his service to Cameroon’s history is beyond our imagination. At a time when everybody was scared of the regime (and rightly so, after the ‘maquis‘ years), he dared to write. From afar, yes, one might say from the safety of France and not Cameroon, he continued his mission of informing, and enlightening us. How many contributed like Mongo Beti to our knowledge of Ruben Um Nyobé? I am sure Mongo Beti’s book “Main basse …” is one of the rare written accounts of Ernest Ouandié. The African writer, Boubacar Boris Diop wrote: “Sans jamais se courber devant personne, il [Mongo Beti] a réussi à faire d’un simple pseudonyme un cri de ralliement. Sa vie durant, il a haï l’hypocrisie, le vain folklore et les faux-fuyants. Il est resté fidèle, jusqu’au martyre, à sa passion de la liberté.” (Without ever bending to nobody, he [Mongo Beti] succeeded in turning a pseudonym into a rallying cry. Throughout his life, he hated hypocrisy, vain folklore, and subterfuge. He remained faithful, up to martyrdom, to his passion for freedom.) Your work, O Mongo, is a true treasure in the archives of Cameroon. Peace be with you Mongo, you are not just a son of the Beti, but rather a son of Cameroon… Peace to you Mongo Cameroon. Thanks Celine, I am glad this could be of help. Is there any subject you would like me to add? Thanks for visiting my blog Elwood. I have posted links in this article which you could go to for more information. I am truly glad to read this weblog posts which includes tons of useful data. Thanks for providing these information. Good day! This post could not bbe written any better! this article to him. Pretty ure he will have a good read. Thanks for stopping by the blog Josette. Please share with your roommate and others as well. 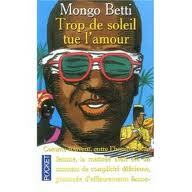 Mongo Beti u are the true son of Africa. I totally agree with you Philemon. Mongo Beti was a true son of Africa, and his works continue to resonate with all today.